There's a relatively new movement afoot here in rural France that has the wine world abuzz. 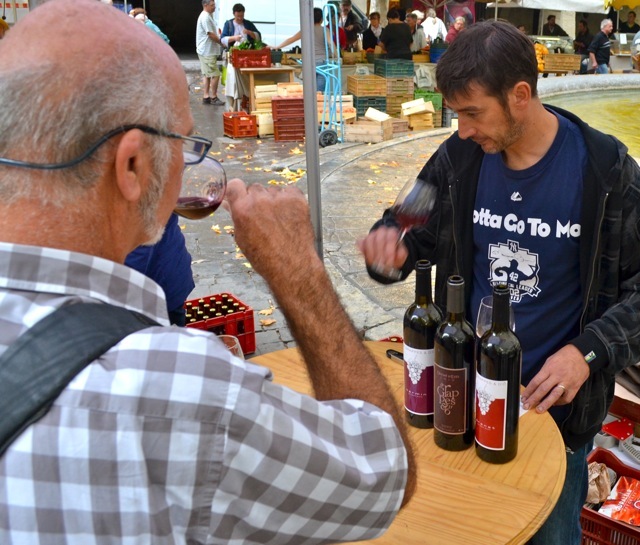 Something called "natural wine" which is made almost like regular wine except it allows none of the 2,000 or so additives, enzymes, boosters of colour and other enhancers that can be used in wine production. Only sun-ripened grapes go into natural wines. That's it. Simple, or so it may seem. The problem is there is not even a trace of sulphites added to natural wines so there is a risk of turning a juicy, well made wine into vinegar in no time. Not a choice for the faint of heart. It takes a special breed, with lots of courage, long-term commitment and a touch of folly to go this far against the grain. My friend Rémi Curtil runs de Grappes et d'Ô, a one-man winery of 7.5 ha just south of Uzès. Rémi is in the wine business for the love of pure, complex wines and the love of the land or the terroir he works throughout the year. He respects the soil and wants to transform the current norm of chemical based production to a much more ecologically friendly organic model. One only has to compare the rich living soil of an organically farmed vineyard to the weed free, barren vineyards of his neighbours to understand the harm we are doing. Rémi has always loved good food and wine and initially trained as a sommelier. After several years working for several top restaurants in Paris, he become head sommelier for the huge Accor hotel chain and got progressively bored with wines that all tasted much the same. Rémi wanted a change so at 25 he went back to school for a year to learn the basics of grape growing and wine making at the Lycée Agricole in Beaune. Since that time he's learned the rest on the job, working for some of the better domains in Bandol, Lirac and les Baux de Provence. 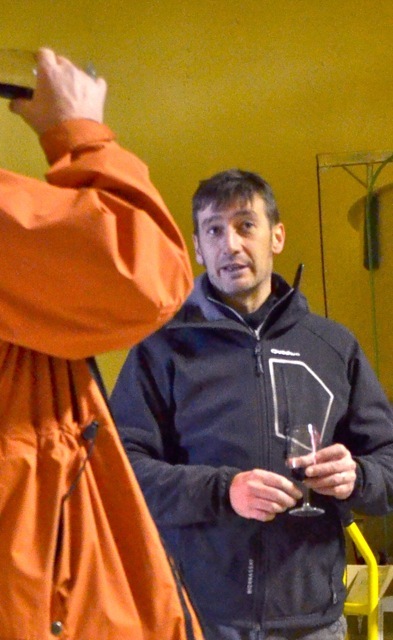 He came to Uzès with the intention of one day starting his own domain and after a stint as cellar master at Domaine de Malaigues, Rémi started up in 2007 with a desire to create artisan, hand-made wines that reflect the vintage and the terroir. From what I have tasted, I would say he has done just that. There have been a few misses along the way but the vast majority of Rémi's wine is balanced and full of character. He is very keen on the newly rewarded appellation status for the wines of Uzès and thinks it will help spread the renown of our local wines. For the moment, Rémi makes mainly red wine; a 100% grenache called Grenat, a 100 % syrah called Carmin and a blend of the two for the AOC Duché d'Uzès. And he is so thrilled about the 2012 vintage he may reserve the best lots for a super cuvée aged in top quality oak. Also in the works; a bag-in-box, unoaked white made from a blend of white grenache, viognier and vermentino. Next year he will release the same wine in bottle. When I ask Rémi if he has any regrets, his broad smile gives away his answer. Even though his adventure represents big risks and an enormous amount of effort, he wouldn't give it up for anything. Long may he run.